You can create a user account on your computer directly from Command Prompt by using the DOS command Net User. This command not only helps to create a new user account on a Windows computer but also helps to modify an existing user account. This tutorial explains the use of the command net user and explains the procedure to create a new user account on a Windows computer. We also check how to modify an existing user account on a Windows computer using net user command. The net user command is used to create, delete and edit user accounts on Windows computers from the command prompt. Let us check different syntax to create, modify and delete user accounts from Command Prompt. While entering username from Command Prompt for a new user account, make sure it is maximum 20 characters long. While typing the password for the new account, you can use maximum 127 characters. Another practical use of net user command is to fetch the full information about administrator account on your Windows computer from the command prompt. 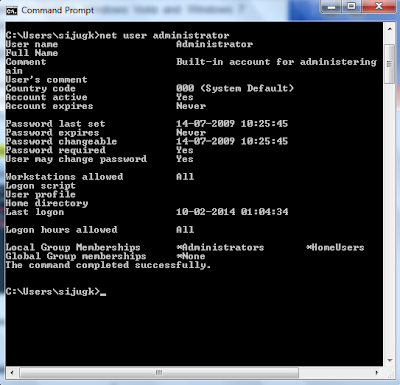 See how I used the net user command to get necessary details about the administrator account from Command Prompt. From this Command Prompt snap, you can see important information like the date on which the user account created, user's country code, the last date on which the password is set and the date on which the current password expires etc. You can also see the last date on which the account is accessed by a user and if there any login restriction is created, it too will be listed.